Hi, my name is Anil van der Zee. I’m 38 years old & a former professional (ballet) dancer from Amsterdam. In 2007 I contracted a viral infection, Cytomegalovirus (the nasty brother or sister of Mononucleosis) and since then, have never fully recovered. A few years later I received the diagnosis Myalgic Encephalomyelitis ( M.E.) better known as Chronic Fatigue Syndrome (CFS). Although the name CFS suggests this illness is all about being chronically fatigued it really isn’t. Let me explain. You can have a host of symptoms like; unrefreshing sleep, cognitive impairment, extreme exhaustion, joint/muscle pain, inflamed lymph nodes, persistent sore throat, severe headache, neurological abnormalities, sensitivity to light, sound, odors, chemicals, foods, and medication. Chronic fatigue or rather extreme chronic exhaustion is just one of the symptoms. Not THE symptom. The cardinal symptom of the illness is Post Exertional Malaise (PEM). It’s a worsening of symptoms that kicks in 24-72 hours after a minor exertion. I describe it as a combination of a heavy flu like feverish feeling without the actual temperature. Your muscles (and apparently also the brain) get lactic acid like you’ve just been biking up a hill from just saying a few words. A feeling of a huge hangover and as if you didn’t sleep for a few nights. Many people experience a lot of pain 24/7. What a lovely feeling! But it’s not just fatigue, you really do feel even more ill than normally for days, weeks or months. In 1969 the World Health Organisation recognised ME as a neurological illness. But in 1988 the Centers for Disease Control and Prevention renamed the illness as CFS. They created new criteria where PEM was not a mandatory symptom for this illness. Resulting in other illnesses where fatigue is an issue, like for example depression, burnout or idiopathic chronic fatigue also becoming a part of the CFS diagnosis as well. That’s where psychiatry took over this illness, like it previously did with Parkinson’s (very nervous people), Tuberculosis (lazy people), MS (hysterical women), Stomach Ulcer (stress), Autism (refrigerator mother)…..
DO YOU BELIEVE IN MAGIC ??? In most countries the common treatments for ME are cognitive behavioural therapy (CBT) & graded exercise therapy (GET), neither of which have any evidence that they work. Many feel that this could actually do more harm than good. 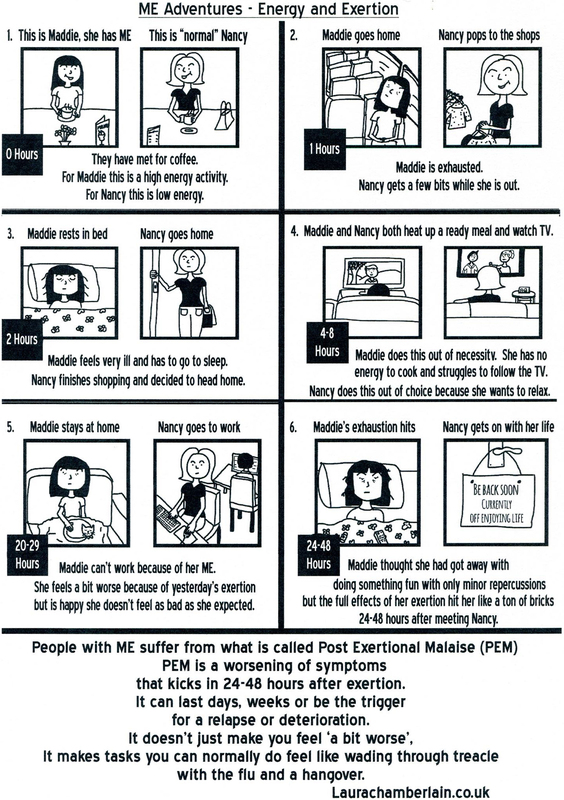 PEM is again not a mandatory symptom to get the diagnosis ME /CFS. Just 6 months of fatigue. The current CBT /GET model for ME is nothing more than an unproven hypothesis that claims that by thinking differently and slowly building up your activity levels you can get better. Some claim that after the clearing up of an initial viral infection there’s either no underlying disease mechanism anymore or it is in fact still a biological illness. Patients without ME / PEM do improve by gradually building up their activity levels, so there are always patients that do recover in CBT /GET clinical trials. But those are not the ME patients with PEM. 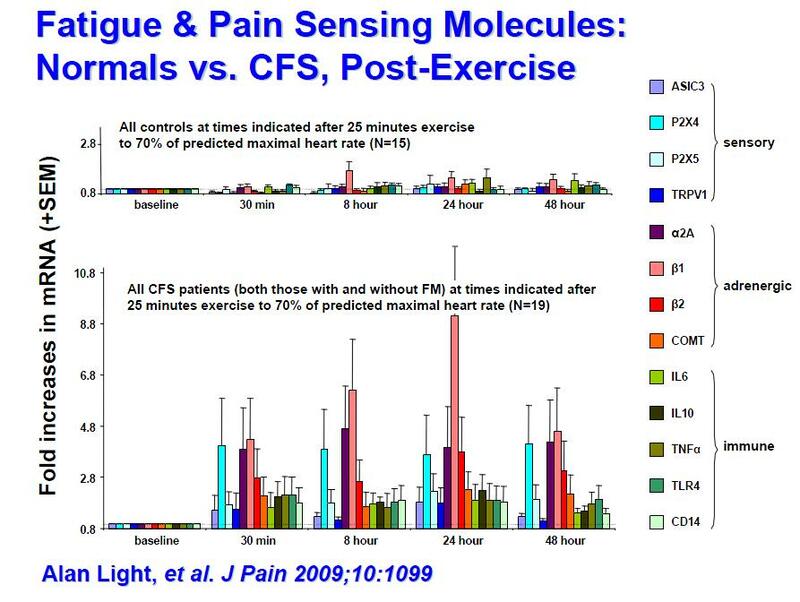 These trials are really meant for people with chronic fatigue. It’s completely misleading to call these trials ME /CFS trials. All the results are subjective. None of the objective measures (walking test, actometer) show any improvement. To make matters worse it turns out that lots of the data has been manipulated to get better results, yet most countries still rely on the outcomes of these kinds of studies. Sadly the ME patients are left much worse off. 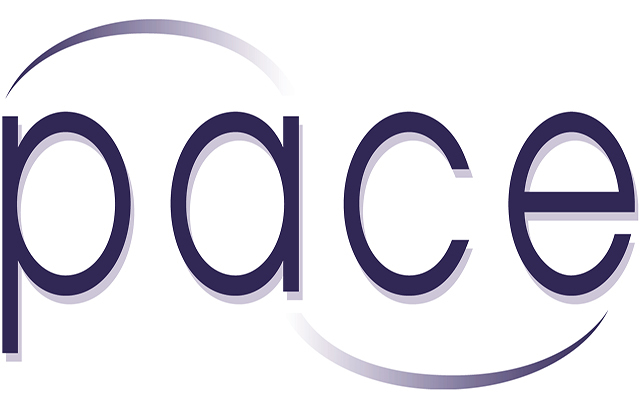 (UK)(NL) Some who were moderately ill ended up being bed bound or wheelchair bound for years to never return to their previous levels before these types of treatments. Myself included. And because of the fatigue label, in many countries proper financial & medical support is a privilege rather than a normality. In Norway 2 oncologists, Øystein Fluge & Olav Mella (Haukland University Hospital Bergen) are conducting a clinical trial with Rituximab, a cancer drug, also used for Rheumatoid Arthritis, M.S. & Lupus. It’s in it’s third and final stage, having previously already showing promising results. Suggesting that ME is an autoimmune disease, like the other 3 diseases mentioned above, but in this case the energy production is inhibited. The body is neither able to produce the correct energy nor is there the correct sort of energy to recover after an exertion. Makes sense right?? But research is going slowy because of lack of federal funding across the globe. In the US, ME gets less funding than male pattern baldness and hay fever. 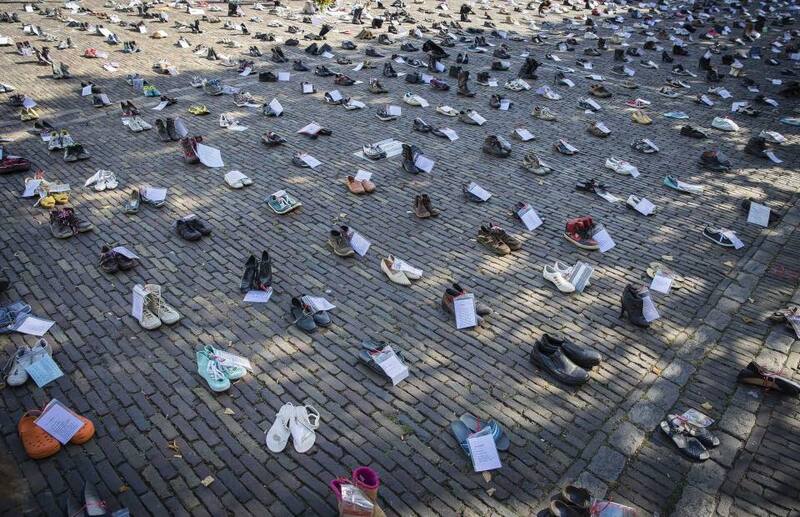 In the Netherlands there has been no federal funding into biomedical research since 2005, so it’s no surprise this illness is still not solved…crowdfunding is the only option. 25% of the ME patients are housebound. I live in a sound isolation cabin in the dark because processing light & noise is too much for me. But I’m still able to leave my bed 15 minutes per day. Haven’t been outside for about 2 years now. Some patients are so ill they can’t turn over in bed, can’t communicate, are tube fed. Staying in that state for years. Some improve but sadly some also die. For some people going to the mall or visiting a friend, that exertion can give them a PEM crash. For me having someone just entering the room and leave without saying a word can make me worse for days or weeks. It’s that extreme. This illness is really about becoming more ill after exertion, and sometimes the worsening is permanently, but it’s not about just being chronically fatigued. Many times people have suggested to me that if I just maybe go outside for a bit, that I might feel better. Just open the window, take a holiday or do other fun stuff and push through the “fatigue”, sadly that’s not going to work. Fatigue is not the real issue here. Millions of people are missing from participating in daily life. 25% of them, children and adults, hidden away in darkened rooms. Millions of research funding are missing to cure this horrible disease. Driving people into total desperation all because ME is considered nothing more than “chronic fatigue”. You can’t talk your way out of ME as you can’t talk way out of any other biological diseases such as Parkinson, Rheumatoid Arthritis or Multiples Sclerosis. ME should not be treated any differently. M.E. is not the same as chronic fatigue, and chronic fatigue is not automatically M.E. Fatigue or extreme exhaustion is a major player in this disease, as it is in other illnesses. Fatigue is not ME specific. PEM is the hallmark of this disease, that needs to be urgently made clear. I don’t want to hear any more stories about people, and especially young children being ignored, blamed, mistreated, neglected or even abused because of the misconception that we/they are just (a bit) fatigued. We need research which must be focused on a cure. Stop investing millions of funding into more useless CBT/GET trials, that could’ve been spent on biomedical research. Maybe you can help us achieve that. For me creating art is a movement, a necessity to feel alive. My therapy and now of course a good way to raise awareness. 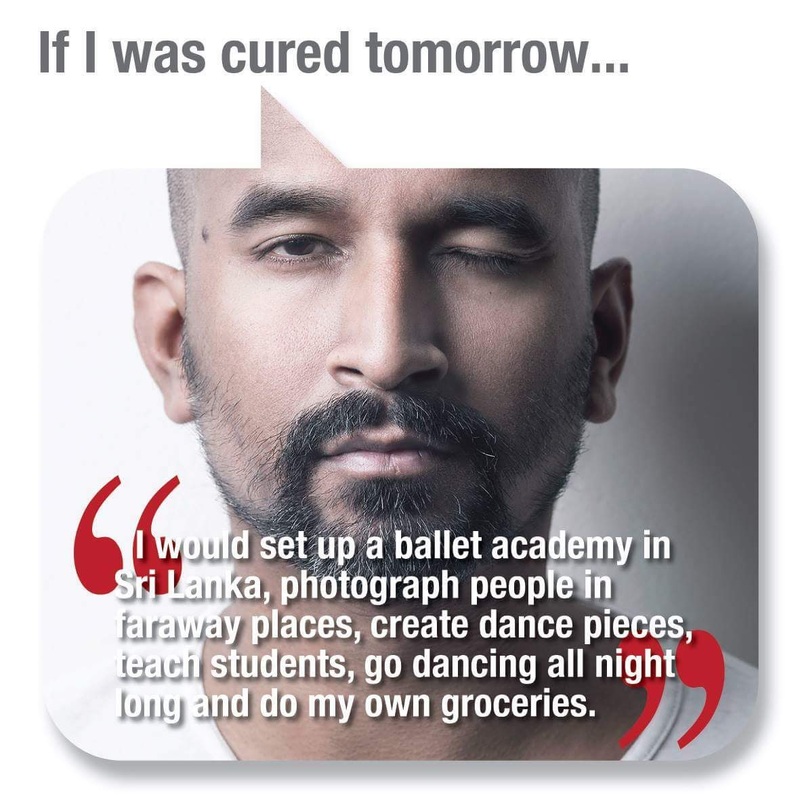 So as I can’t create that “movement” in any way, I asked some my fantastic friends, who are (former) professional dancers and fellow artists to do it for me. And for all the patients that can’t live their lives because of ME and PEM. How can you help!?! Go out there & dance, choreograph, sing, act, draw, play, photograph. Whatever you feel comfortable with. In your living room, studio, theatre or even better in the street. Maybe you have some older work you want to dedicate to the cause, create a small piece or dedicate a whole evening. But whatever you do. Film it, put it online (Facebook, Twitter, Instagram) . Ask /invite a few friends to do the same. Thank you for your time. Please spread the word, share this blog all over the place, don’t forget to create & don’t forget to donate.